These embroidered cushions have been created as a gift for King Gabriel I and Queen Constanzia I, whose reign was in the style of Spanish courts of the sixteenth century. 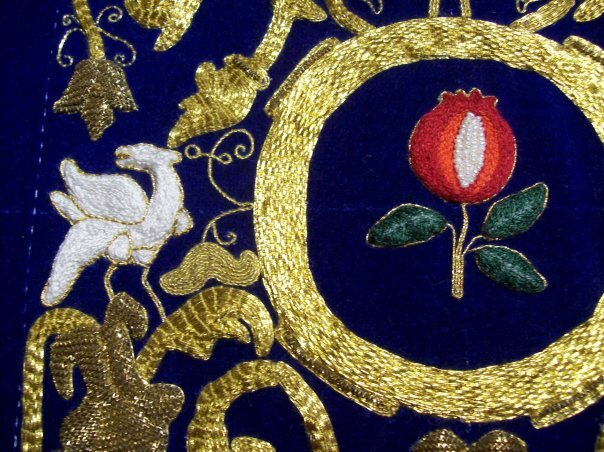 The style and materials used for the embroidery were selected to reflect the style of Their reign and are common amongst the extant examples of sixteenth century Spanish embroidery. The documentation, written by Lady Ceara, can be downloaded here: Politarchopolin Royal Gift to Gabriel and Constanzia ASXLIV (pdf). The concept design and research for this project was undertaken by Lady Caera. The goldwork was planned out by the ‘goldwork team’ under the direction of Mistress Mathilde and mapped out by Lady Ysabella. This design was brought to the Barony and 21 volunteers helped to create the finished product. 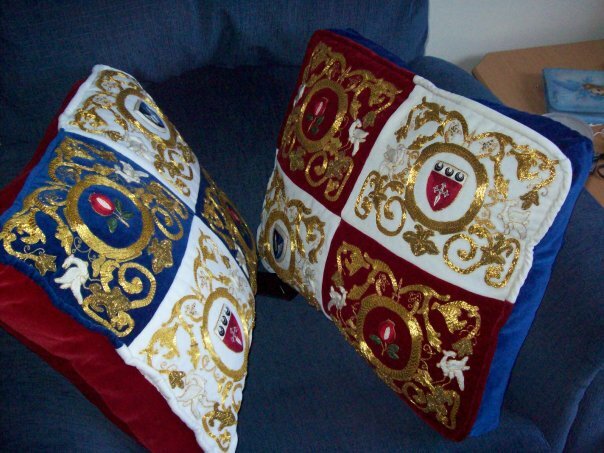 Several members within and outside of the Barony have kindly donated materials to create these cushions. It was an expansive group effort!This project was designed to accomplish several things. First and foremost the project aimed to create a unique gift or the Barony to gift Their Majesties in honour of Their reign and Their visit to our Barony during Their reign. Secondly, it was a group Arts and Sciences project aimed to encourage and teach the Barony. The vast majority of volunteers had never done embroidery. On top of this, most of those who were not strangers to embroidery learnt at least one new embroidery technique through the creation of these cushions. In this way the project accomplished its goal of teaching arts in the Barony. Those six or so individuals who participated in mounting and framing the panels pre-embroidery learnt, through the teachings of Mistress Mathilde, the methodology in successfully mounting velvet for embroidery onto rectangular frames. It has taught the Barony the value of team-work and the importance of working, and sticking, to a deadline. Also, we learned to appreciate the amount of time and effort that goes into planning, designing and creating goldwork pieces. Over the course of three months this project took approximately 600 hours to complete, which is a colossal effort by any measure!